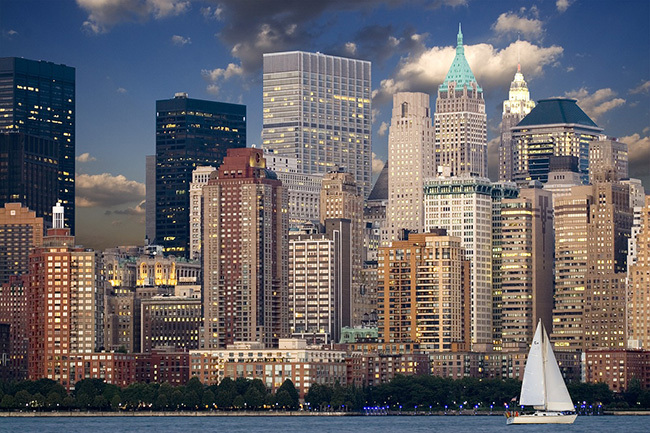 Nicknamed the “Empire State“, New York state is known as that due to its national and global significance. From New York City to Niagra Falls and the scenic Catskill Mountains, New York state has it all! When a person thinks of New York state, many thoughts come to mind. Most people recall images of the constantly bustling Times Square, one of the many world-renowned museums, or the celebrity studded avenues. However, the Big Apple is far from the only spot in the state that is frequented by stars. Head Upstate to discover where some of the world’s biggest celebrities got their start or spend their days. Over the years, Hudson Valley has been filling up with celebrities visiting for the weekend or purchasing a summer home escape. Both proud of their connection to Hudson Valley, Jimmy Fallon grew up in Saugerties while Robert De Niro has an estate in Gardiner. Around an hour’s drive from Manhattan, the region has the Hudson River running through. Many of the towns offer scenic views with easy water access. Major attractions include Walkway Over the Hudson, Mohonk Preserve, Culinary Institute of America and the Storm King Art Center. This region is also known for being the home to many creative minds. Orson Welles, John Steinbeck and Laurence Olivier – all looking for artistic inspiration from its history and nature. If you happen to be visiting one of these towns, check to see if the person waiting behind you shows up on your newsfeed. When the temperatures rise, celebrities flock to the Hamptons. While some rent a beachy bungalow, many own their own pieces of heaven. For example, Jennifer Lopez, Brooke Shields, Steven Spielberg and even Paul McCartney. Whether you’re wanting to relax in the sand with a Long Island iced tea in hand, it’s amazing. Enjoy an active getaway (like surf lessons at the Surf Lodge,). The Hamptons is much more than just a beach. The Peconic Bay is home to a world-class winery, and nearby is the Parrish Art museum, which is a stylish and contemporary visit. If the kids are in tow, no worries. Between bouts of beach fun, check out the Long Island Aquarium and Exhibition Center. No matter what you choose to do at this legendary spot in Long Island, you’ll be sure to have an A-list time. You may be surprised that the Baldwin brothers grew up in Orange Nation. Follow in their famous footsteps when you visit! Check out the Erie Canal Museum. While there, experience a part of history that played an imperative role in the growth and development of the country. For delicious BBQ with a musical edge, head over to nationally acclaimed biker bar, Dinosaur BBQ. To see the natural beauty of this region, pack your sleeping bag and camp out. Stay in Green Lakes State Park, consisting of two glacial lakes surrounded by upland forest. Syracuse has a strong tie to the Underground Railroad. As one of the most openly abolitionist cities in the 1850’s, it was vital in the sanctuary of hundreds of runaway slaves. No matter what you’re looking for, Syracuse is the perfect spot for foodies, history buffs, outdoorsmen and of course college sports fans. While Rochester is stunningly beautiful year-round, the summer in particular boasts a blooming landscape and even an impressive lineup of festivals. This spot has something for everyone, even celebrities. SNL and Bridesmaids star Kristen Wiig is from this vibrant arts-focused city set in the Finger Lakes region. Whether you’re interested in the George Eastman Museum of photography and film, the Memorial Art Gallery, or the Geva Theatre Center, Rochester is awesome. When it comes to entertainment, this spot has it all! Wanting a more secluded getaway? Check out Highland Park arboretum and gardens, or the Genesee Valley Park. Celebrity chef Rachael Ray grew up in the Capital-Saratoga region. This beautiful spot is not only full of “yum-o” restaurants. Plus it also claims the New York State Capital, local breweries, museums and parks. Immerse yourself in New York State’s first historic district. From there, end your night with a touring Broadway performance at Proctors theatre. Enjoy thundering thoroughbred horses at Saratoga Race Course and top ballet and orchestra performances at Saratoga Performing Arts Center. Marvel at the beautiful architecture and industrial history of Troy. Or spend the day touring different farms and experiencing local foods and manmade products in nearby Washington County. Take in the great outdoors in Fulton County, where you have the option to swim, fish, boat and more in one of the 44 lakes. Located only a few hours north of New York City, the Capital-Saratoga Region is easily accessible by train, plane or car — the only difficult part will be leaving. Friday Night Light’s Kyle Chandler and Chad Michael Murray of One Tree Hill both have Buffalo roots. The second largest city in the state has seen quite the renaissance. Relax by the Erie Canal at the renowned Canalside or check out contemporary art by the likes of Picasso and Warhol. If architecture is your thing, be sure to visit the Darwin D. Martin House (designed by the legendary Frank Lloyd Wright). This place has been restored to serve as a museum with guided tours. Rent a boat and check out the Basin Marina. Simply sit back and enjoy the countless parks and monuments found all around the city! And to state the obvious – buffalo wings. You may have heard that laughter is the best medicine, but have you heard that laughter makes for the best vacation? Legendary comedian Lucille Ball was from Jamestown and you can follow in her footsteps. The National Comedy Center opens this August. It will be the first non-profit cultural institution and national visitor experience specifically focused on the art of comedy. While lesser known than some of its neighboring destinations, the area is seeing major developments on top of its natural wonders and cultural gems. If you’re itching to get out of the sticky summer heat, you’re in luck. Escape it for lake breezes on the coasts of Lake Erie, wine-drinking and lots of laughs. This summer is set to be one of the funniest. The Life of Luxury offers the best luxury vacations to anywhere is the world. Whether it’s New York State, Paris, London, Dubai, Beijing, Tokyo, Sidney or more, travel in VIP style! We hope you enjoyed the above New York state article. Be sure to return and follow this leading, luxury blog. Read about top tourist destinations around the world.